The chemical degradation of nutrients and pigments in stored frozen foods frequently follows first-order or approximately first-order kinetics. If their concentration ratios after storage for times and at temperatures and , respectively, are experimentally determined, then it is possible, at least in theory, to extract their kinetic parameters from these endpoints, assuming that the rate constant&CloseCurlyQuote;s temperature dependence follows the simple exponential model (a convenient substitute for the traditional Arrhenius equation). 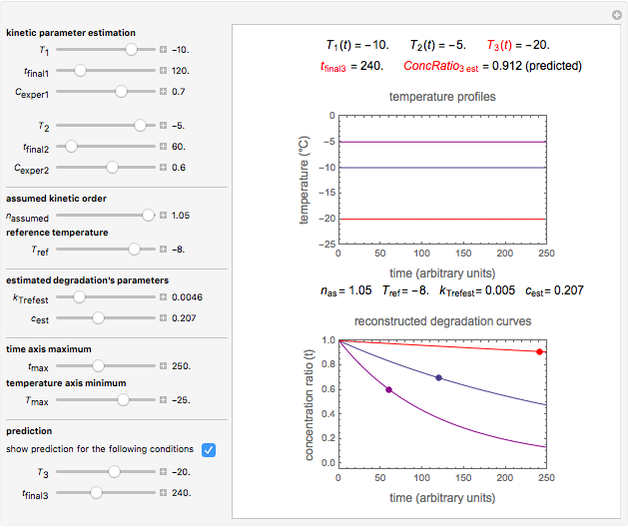 This Demonstration exploits this principle to recreate the entire degradation curves at the two temperatures (both must be below the freezing point) and predict those at other frozen temperatures by numerical solution of the two corresponding simultaneous nonlinear equations. The solution is aided by matching the two endpoints with their recreated degradation curves on the screen, using sliders. The degradation of vitamins or pigments in frozen foods frequently follows fixed-order kinetics of order or . 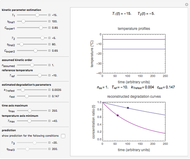 The temperature dependence of the rate constant frequently follows the exponential model , where is the rate constant at temperature , is the rate constant at an arbitrary reference temperature , all temperatures are in degrees Celsius, and is a constant. This simpler model can replace the traditional Arrhenius equation without sacrificing the fit . 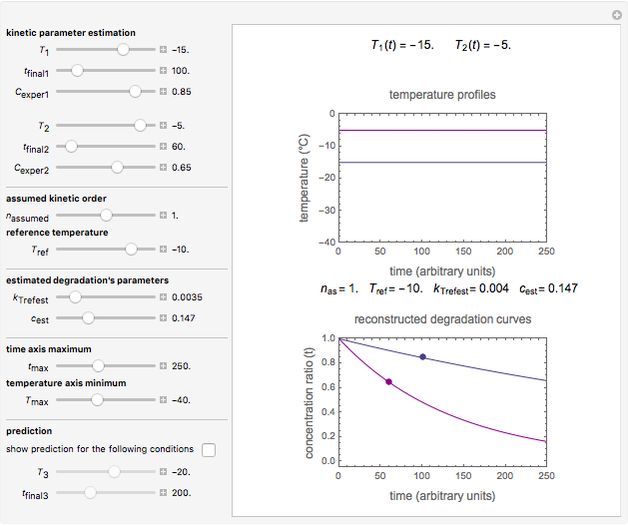 At two constant low temperatures and , the two corresponding degradation curves can be described by a pair of rate equations and , where the s are the corresponding concentration ratios. These rate equations' isothermal solutions for times and are and , and they have to match the experimentally determined concentration ratios, i.e. and . This creates two simultaneous equations, where the two unknowns are the exponential model's parameters and . 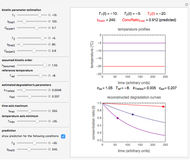 To do the calculation, enter the two frozen storage temperatures and as negative numbers, corresponding to concentration ratios and at the times and , the assumed reaction order ( ), and an arbitrary reference temperature , preferably between the two chosen temperatures. Once these parameters are set and displayed, try to match the two shown generated degradation curves with the two chosen endpoints by moving the and sliders. The match can be more finely adjusted by changing the numerical values of these two parameters displayed to the right of the sliders. When a satisfactory match is obtained, the corresponding and parameters' values, which are also displayed above the bottom plot, can be used as the initial guesses for solving the rate equations or considered as estimates of the parameters' values themselves. 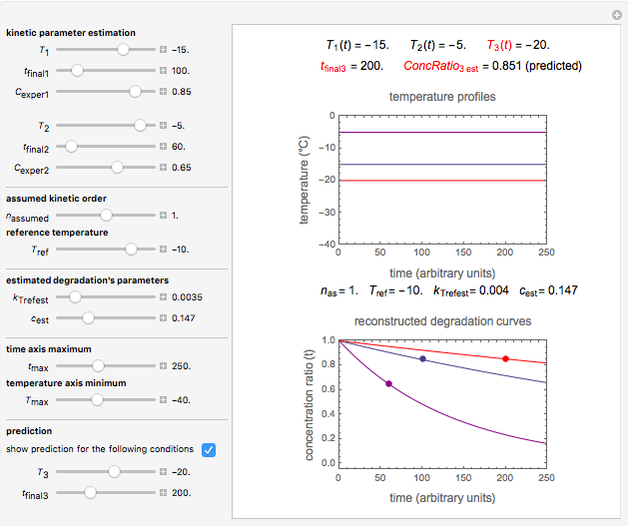 In that case, by checking the "show prediction for the following conditions" box, you can recreate the nutrient's degradation curve at any other selected frozen temperature (red curve) and estimate and display the concentration ratio at any chosen time entered with the slider. 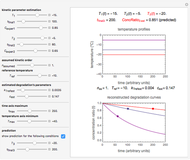 Not all time-temperature-concentration ratio entries allowed by the program must have two matching degradation curves. Some entries may reflect experimental errors, a reaction kinetic order outside the permitted range, and/or nonlinear kinetics in the particular system. Mark D. Normandand Micha Peleg "Endpoints Method for Predicting Chemical Degradation in Frozen Foods"